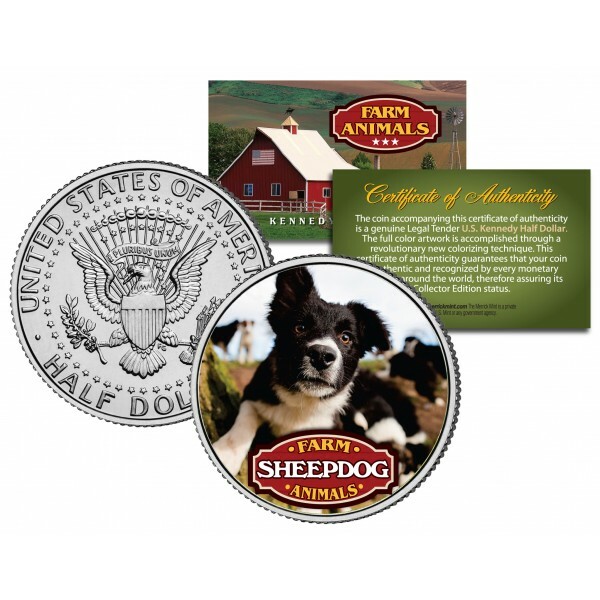 This COLLECTIBLE FARM ANIMALS SERIES – SHEEPDOG coin is a treasured collectible, combining the popularity of Farm Animals with coin collecting. Here is your chance to own a beautifully colorized JFK Kennedy Half Dollar U.S. Coin. This high-quality genuine Legal Tender U.S. coin has been colorized using a unique painstaking multicolor authentic process. Colorizing coins involves the unique application of special inks directly to the surface of a coin that achieves a level of detail, color saturation, and durability that is #1 in the coin industry. The result is an everlasting colorized coin collectible of ultra-high quality. Each coin comes in a premium coin capsule with a Certificate of Authenticity to guaranty that your coin is authentic and recognized by every monetary authority around the world, assuring its Collector Edition status. 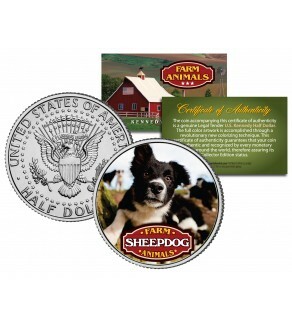 Sheepdogs are used on farms for herding farm animals.